Although real life pack rats (genus Neotoma) build large piles of debris to nest in, Mr. Pack Rat isn't satisfied with plain old sticks and leaves. He wants novelty and variety, and--unfortunately for him!--he owns a magical magnet that can summon anything he desires. Mr. Pack Rat is always on to the next thing. Lovely flowers will brighten up his sticks and leaves... until they wilt. Colorful seashells won't wilt, but they aren't much fun. Games and toys are fun, but only if you have enough room to play with them. In addition to other writing, Marcus Ewert has worked on children's books since his teens, achieving acclaim with his award-winning books 10,000 Dresses (2008) and Mummy Cat (2015). 10,000 Dresses has been used in schools, churches, and youth groups around the world, as the first children's book featuring a transgender character. 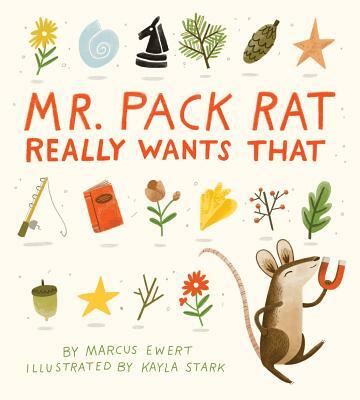 A hoarder himself, Marcus wrote his most recent book, Mr. Pack Rat Really Wants That, to puzzle out a resolution to his personal hoarding dilemma. Marcus lives in San Francisco, in a beautiful--and de-cluttered--apartment. Kayla Stark is a freelance illustrator currently living in Nashville, TN. Most of her work is illustrated using a combination of traditional and digital media. She typically incorporates animals and nature into her work one way or another. Kayla's art has been used for a variety of markets, including in children's books and educational materials.